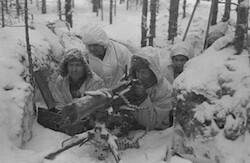 The Finnish 9th Division finally manages to encircle the Russian 54th Division in Kuhmo. Division’s commander General Vinogradov, authorizes the remainder of his troops to try escape back to Russian lines. House of Commons vote for war credits of Â£1,600,000,000. Hitler makes one last appeal to the Spanish leader, General Franco, to enter the war. The Bishops of Norway start the Church’s struggle against the occupying German forces. British blocking forces at Beda Fomm, but cannot. Adolf Hitler sends Field Marshal Erwin Rommel to North Africa to help the Italian forces. President Franklin D. Roosevelt asks Congress to support the Lend-lease Bill to help supply the Allies. In his annual message to Congress, President Roosevelt announces the “Five Freedoms”. Churchill demands that troops be released from Wavell’s offensive and sent to Greece. The Luftwaffe launches its first attacks against British convoys bound for Malta in the Mediterranean. Roosevelt announces that US forces are to be based in UK. massacred. ‘The Soviet Union will never forget or forgive’. Rommel’s battered forces reach the Tripolitanian frontier having evaded all British attempts to cut them off. The British are pushed back to Gazala. The British Commonwealth forces lose 40 tanks, 40 field guns and 1,400 troops. This was a disaster for the Allies in more ways than one. Now the Allied convoys to Malta must pass between Axis occupied Crete and Axis airfields in Benghazi. Russians cut off Army Group A by reaching Yeysk on the Sea of Rostov. The Americans outflank the retreating Japanese on Guadalcanal. The allies announce that jet-propelled aircraft will soon to be in production. The Red Army crosses the 1939 Polish frontier after a 170-mile advance in just two weeks. The Japanese pressure in Arakan forces the British to retreat. Kwajalein Island in the Central Pacific falls to U.S. Army troops. The 1st Belorussian Front makes further advances to reach the Oder between KÃ¼strin and Frankfurt. The ban on dancing is lifted in Finland, where it had been illegal to dance during wartime. Boeing B-29 bombers in the Pacific strike new blows on Tokyo and Nanking.